NEW YORK (NYTIMES) - Three social media stars who made a living travelling the world and chronicled their experiences online died last week after an accident at Shannon Falls, about 56km north of Vancouver, British Columbia. Charles Ryker Gamble, Alexey Lyakh and Megan Scraper were affiliated with the Canadian group High on Life, an online brand that promotes travel and an adventurous lifestyle to hundreds of thousands of followers. 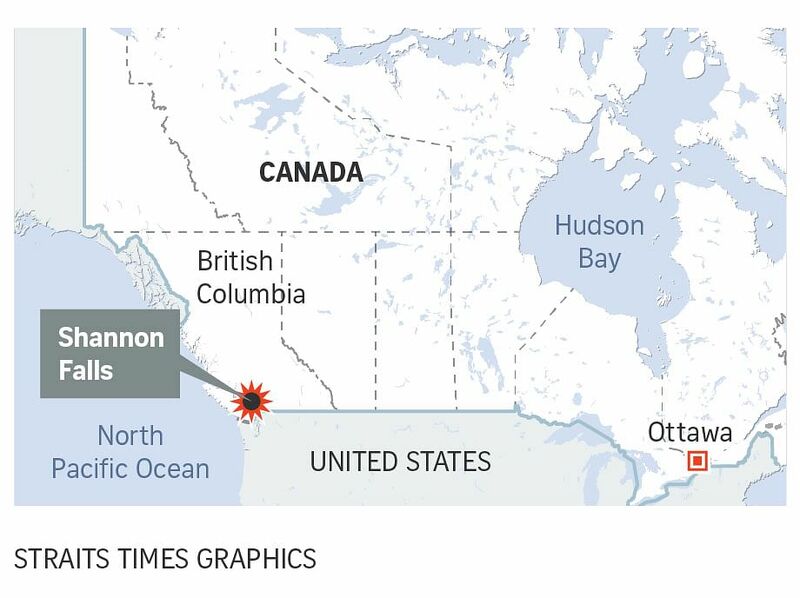 Authorities recovered the bodies of three people who fell about 30m on Tuesday (July 3) while swimming in a pool at the top of Shannon Falls, the Royal Canadian Mounted Police said in a statement. Police did not identify the victims, but High on Life released a statement on Friday confirming that three "dear friends" of the community had died. "They stood for positivity, courage, living the best life you can," High on Life said in a statement, adding that Gamble, Lyakh and Scraper had shared those values with people around the world. "As tragic as their loss is, their message lives on through us all, and it is now our responsibility to keep the message going," the statement said. The accident stunned and devastated many who had followed the trio online and drawn inspiration and motivation that they, too, could turn their own wanderlust into a reality. But others seized on their deaths as a moment to warn against thrill-seeking for an online audience. High on Life is a collaboration between Gamble, Lyakh and another friend, Parker Heuser, who had known each other since high school, according to the group's Facebook page. They chronicled their escapades on a YouTube channel, posted photos from around the world to more than 1 million followers on Instagram, and sold tank tops and other clothing online. The motto behind their travel and outdoor lifestyle is "If you can, you should." But that philosophy also played out in risky stunts, such as cliff jumping and rope swinging from extreme heights. And several members got into trouble in 2016 after they were seen walking on the large, multicoloured Grand Prismatic Hot Spring in Yellowstone National Park. Gamble and Lyakh were among those who pleaded guilty to charges related to their behaviour in several national parks, according to the National Park Service. Lyakh was reportedly dating Scraper, who had her own following under the online persona Mindy the Lion. She wrote an e-book, "Not Cut Out for the 9-5," about leaving the corporate world to develop an online business that would allow her to travel, according to the book's page on Amazon. It is unclear what the trio was doing at Shannon Falls. CBC News reported that the area is accessible from nearby hiking trails and the Sea to Sky Gondola. Gamble's cousin Rob Mangelsdorf told The Canadian Press that he believed the group simply went for a hike. "They weren't doing anything silly," he said. John Willcox, a spokesman for the Squamish Search and Rescue, a volunteer group based nearby, told The Canadian Press that a woman was swept from one pool into another and that two men were also carried away after they tried to help her. High on Life did not return a request for comment on Saturday night, and the Royal Canadian Mounted Police did not respond to a request for more details. A fundraising page created by the group said a "legacy fund" would be created to support causes that aligned with the values of Gamble, Lyakh and Scraper: "empowering others to pursue their passions and dreams, and to live life to the fullest."